How much interest has there been in your articles? How often have they been cited or shared? Find your scholarship in Web of Science either by searching for articles by title or by author. Alternatively, create a ResearcherID and establish your publication list, from which individual article metrics may be viewed. Once you have a list of your articles, metrics are found at the right-hand side of the results list page or in individual article records. Usage Count – the number of times the full text of a record has been accessed or a record has been saved - not necessarily cited. 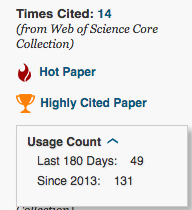 To view the articles citing your paper, simply click on the Times Cited number. Find your scholarship in Google Scholar either by searching for articles by title or by author. Alternatively, create a Google Scholar My Citations account and establish your publication list, from which metrics may be viewed. The Cited by data is available under the abstract of the article in the Google Scholar result set. To view the Cited by articles, simply click on the Cited by link. 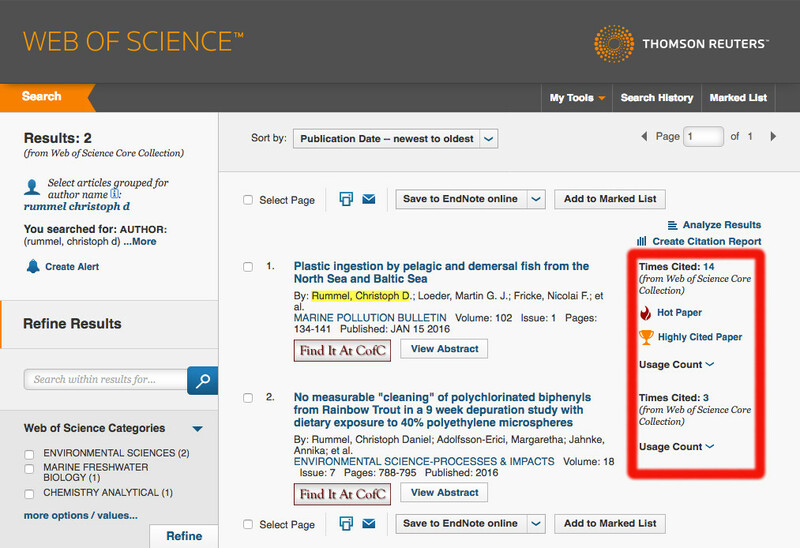 Altmetrics can be obtained by using the FREE Altmetrics browser bookmarklet! 1. Visit https://www.altmetric.com/products/free-tools/bookmarklet/ and install the plugin in seconds. 2. Find your article online at the publisher's website. *Note, to work, the page must include an article's Digital Object Identifier (DOI). 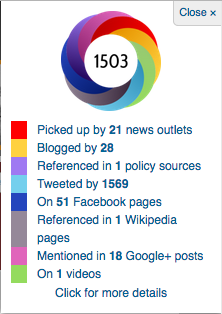 3.Click the Almetric It button in your browser and view your article's Altmetric data. Searches the following databases: Aquatic Sciences and Fisheries Abstracts (includes Oceanic Abstracts), Dissertations & Theses Full Text: Science & Technology, Environment Sciences and Pollution Management, and GeoREF. SciFinder provides access to several Chemical Abstracts Service databases. It is the world's largest and most comprehensive database of chemical information. NOTE: First time users must register with SciFinder Registration before using the Scifinder database. Registration is restricted to those with a CofC email account.